Depending on where you live, your experience of a southerly wind may be a warm, gentle breeze, or if you’re from Australia it’ll be something much more stormy! I’ve already mentioned that around the Adriatic, and indeed throughout the Mediterranean, the winds have names. The most powerful of them is the bura – that powerful katabatic wind from the northeast. And almost as strong a force in winter, we have the jugo also called šiloko or širok on some parts of the coast. Jugo is pronounced you-go, and širok is sheerok – the same wind known elsewhere in Europe as scirocco. 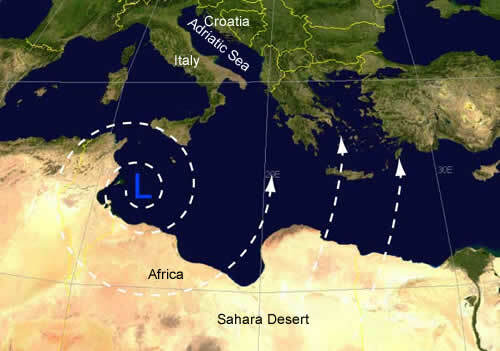 This wind blows from the Sahara, usually pulled by a low pressure system in the northern Mediterranean. The air is scorching hot when it leaves Africa, and may be carrying sand. There was one morning we found the island covered in dusty Saharan sand delivered by a jugo overnight, all over cars, houses and everything. Our own little sandstorm! The hot air from Africa, bringing sand or not, crosses the main body of the Mediterranean on the way north, picking up plenty of moisture as it goes. Somewhere over the Adriatic it finds a mass of colder, northern air moving in from the Atlantic, and rises up over it. Now in rising, it also cools and all that water just picked up condenses out again forming fog, thick grey clouds and heavy rain! The effect may vary depending on other conditions but that’s the general picture! Meanwhile at sea level, big waves built up by the wind now smash into southern-facing shores with some force. 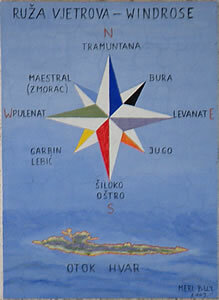 This includes the winery tasting rooms of Zlatan Otok in Ivan Dolac, right down on the coast. The low pressure also pulls up the water, giving super-high tides, known as aqua alta in Venice. On Hvar, these extra high tides in Stari Grad will have seawater bubbling up out of street drains that more usually conduct rain away into the bay. The fiercest jugos hit during autumn and spring. Blowing from the southeast up the coast, they build slowly over several days finally reaching gale force, causing high seas and serious damage. The strongest recorded wind gust for a jugo was logged at Palagruža on 4th March 1974 – a whopping 56.9 m/s or 127 mph! The catamaran service doesn’t run, and neither do the emergency helicopters. However, Tin Ujevic recently set out on a mission of mercy from Hvar to carry a pregnant woman to hospital during the jugo. It seems that babies born on a Jadrolinija ferry get free crossings for life – congratulations to that new islander! ISOLATED THUNDERSTORMS IN THE NORTH, DURING THE NIGHT AND IN THE MORNING IN THE REST OF THE ADRIATIC AS WELL. GUSTS OF SE WINDS 35-45, DURING THE NIGHT AND IN THE MORNING UP TO 55 KNOTS. SEA 4-5 DURING THE NIGHT AND IN THE MORNING. SE winds 14-28, in places from the middle of the night up to 32, in the Central and South Adriatic up to 36 knots. Sea 3-4, during the night 4-5. Visibility 10-20, in places with mist less than 10 km. In the North, during the night in the rest of the Adriatic, mainly cloudy with rain, showers and thunder. Cloudy with rain, showers and thunder, in places with even more abundant precipitation, mainly in the Central Adriatic. Strong, in places up to near gale force, in the Central and South Adriatic possibly up to gale force SE winds. Sea moderate and rough. Air temperatures with no change or a little lower. Basically, not weather you’d like to go out and about in! Indeed Dalmatians firmly believe that the južina brings on all kinds of ills, headaches, insomnia, general irritability and depression. Whether it’s caused by the low barometric pressure, or the prospect of several days or possibly weeks of dark clouds and rain, many people appear to be badly affected. It’s even said there was a rule in the old Dubrovnik Republic that no laws were to be passed during južina! That idea goes back a long way. From the times of the ancient Greeks, Hippocrates’ view was that the south wind was a harbinger of disease, as opposed to the much more healthy north wind. And Francis Bacon in his “History of the Winds”, published in 1622, wrote: “In a south wind the breath of men is more offensive, the appetite of animals more depressed, pestilential diseases are more frequent, catarrhs common, and men are more dull and heavy”. So there, it must be true! In any case, it’s a good excuse to wait for better weather before doing anything! As a general rule, a jugo will be followed by a bura, chasing out the clouds and rain, and replacing them with clear blue skies and sunshine – although it will be somewhat colder! What news from the South, oh sighing wind, do you bring to me at eve? again a most interesting item ! And on top of that, it took me deeper back into all you wrote on your blog before, with even more highly interesting stuff. Thanks a lot for all research you did, truly fine work ! Question: why is the fortress called Spanish, as I somehow missed that ? (It makes me very humble, chitchatting about beer in my on pages). I’d be interested to know how the jugo and južina affects inland Dalmatia – does that massive coastal mountain range block it? And maybe the winds don’t have names there? wish I could explain the different winds here, but I can’t. First of all, remember I am a Dutchman :-), and in Holland winds were pretty predictable (mostly W-SW-NW but always a West component in it). During winter or summer Easterly winds dominate, and that’s about it. Here, in our valley, just behind Omiska Dinara, I still don’t understand it for a single bit. Yes of course, we’ve got bura or jugo (and I know now what it means to be a “meteopat”, as fearce jugo dóes effect feeling of well-being). But the problem here is that Biokovo, Omiska Dinara and Mosor effect general conditions in such a way that to me it’s still a total mystery how weather will develop during day for us here. For general predictions I use a couple of weathercharts, dynamic satellite images, and forecasts for Omis, Split, and also Biokovo. As you may understand, having sailed almost all my life (dingy’s, catamarans, yachts, anything with sails), weather is still highly interesting to me. Bad luck for the Italians, as thát I know, they get the heaviest blows here, like Ireland and England did for us Dutch :-). If you like, I can send you a couple more links. Ps. did of course read about Spanish Fortress in your blog, but seemed to have missed that one single sentence about those Spanish engineers).